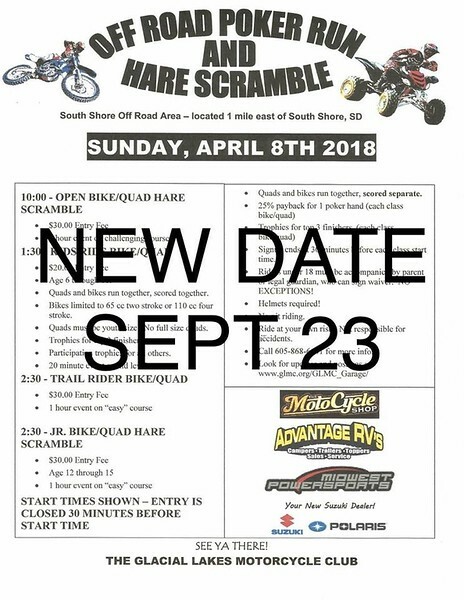 Due to weather and track conditions, the GLMC Off-Road Poker Run and Hare Scramble scheduled for April 8 has been POSTPONED until further notice. Updates will be posted here on the message board and on our Facebook page. The upshot is depending on the date, now I have a chance to make it. Webmaster, please update the main page dates. Revised PDF would be good also. I found this on Facebook. Is this the actual new date? (08-16-2018 11:30 AM)Abercrombie Wrote: I found this on Facebook. Is this the actual new date?